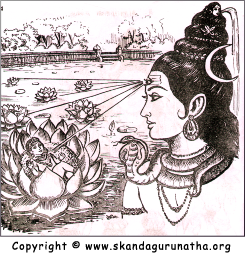 Kantha Puranam is the Tamil version of the sanskrit epic, Skanda Puranam. It was written by Kachiyappa Sivachariar of Kumara Kottam at Kanchipuram. He lived at Kanjeevaram approximately 1100 years ago. Kachiyappa Sivachariar was a very fortunate and blessed devotee of Sri Skanda. Before the age of 10, he mastered all learning including his specialty, the Sivagamas. Kachiyappa Sivachariar awoke and thought over this wonder, and thought over and over again, the kind commission accorded to him by his Lord. He took up the task and finished it suitably. According to the account of Kachiappa, each day he would write his inspired account of the career of Lord Murugan or Skanda, and in the evening deposit his day's work in the mûlasthâam of Lord Subrahmanya at Kumara Kottam. Each night, miraculously, the Lord Himself would modify Kachiyappa's manuscript with His own corrections. Hence, the Kanda Purânam is considered to be the absolutely authoritative account of Lord Murugan's career bearing the seal of approval of none other than the Lord Himself. When for recognition it was read before an assemblage of Pandits, some questioned his interpretation of the first line, God-given. Then Lord God Himself inspired one and stated that the grammar for it could be found in Virasolliyam, a very ancient Tamil work. All wondered at this divine favour and declared the work authoritative. The original Kantha Purânam was intended to be recited aloud in Tamil to audiences who were already well-acquainted with the marvelous career of Lord Murugan. This illustrated version of Kantha Purânam is intended to be seen and read by devotees young and old who live near or far from the sacred places mentioned in this purânam. May all obtain the grace of Lord Murugan merely by beholding this sacred account. The following Tamil to English Transliterations are by Sri Viswanath V Rao who dedicated much of his time to do this wonderful service for all of Lord Skanda's devotees. It will be much appreciated by bakthars who frequent this website. God bless you!